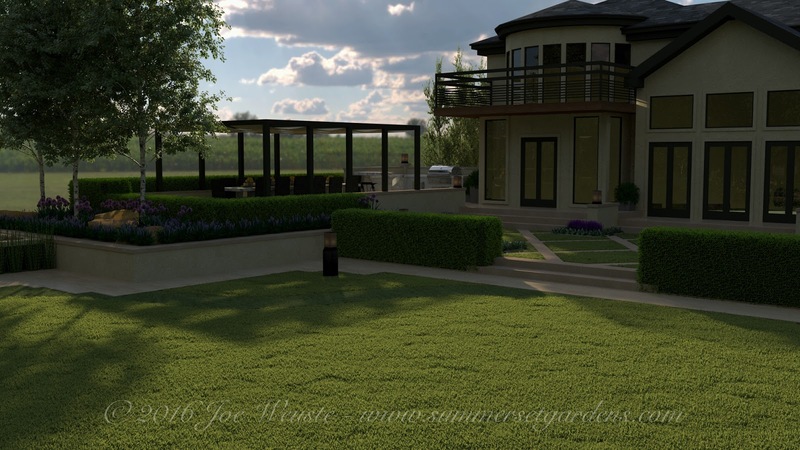 A backyard landscape design project located in the NY Hudson Valley. I created a series of outdoor rooms, separated by a series of walls, steps, hedges and planting beds. I incorporated several seating areas, and outdoor kitchen, fireplace, and pergola. Above, the upper lawn area with a stone inlay. This space is enclosed with a low Boxwood Hedge. To the right, rear is an upper terrace...designated dining area that seats 12. A pergola creates shade. Above is a seating/lounging area. This space is framed with Horse Tails planted in a custom designed planter to keep this invasive plant contained. A view from the house to the infinity edge water feature at the rear of the yard. A grouping of Boxwood form the backdrop for the water feature and framing the view are a grove of White Birch Trees to the left and right side. A view of the upper dining terrace and outdoor kitchen.